Dereck Chisora vs Carlos Takam: Who Wins? It has been announced how heavyweight fringe contenders, veterans Dereck Chisora and Carlos Takam will collide on the continually-growing O2 card in London topped by Dillian Whyte Vs. New Zealand’s Joseph Parker. Some people, this writer included, questioned whether or not the July 28 headliner was worthy of carrying a pay-per-view, or Box-Office, platform, and to be fair, Eddie Hearn is stacking up the card. 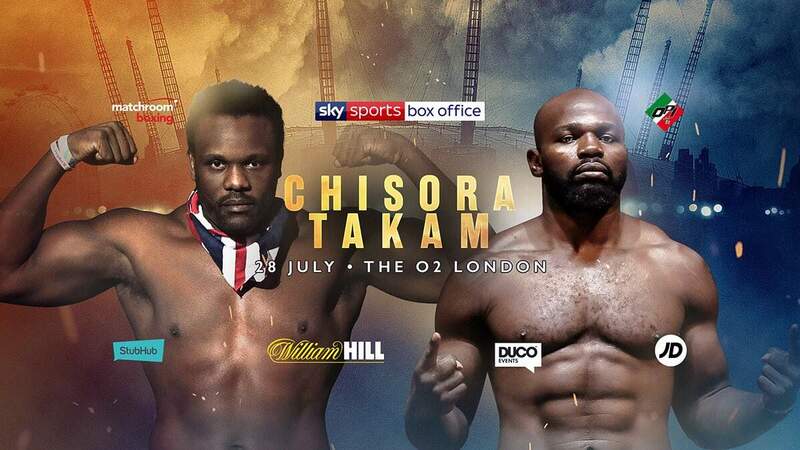 Kell Brook will also feature, in a final eliminator, along with female superstar Katie Taylor, but the addition of the almost always entertaining Chisora and Takam – both of whom are more than capable of sending the fans home happy – will likely inspire additional fans to buy the July card. Takam, who gave both Parker and Anthony Joshua a real test, is happy to return to the UK to box, while Chisora will no doubt be pleased to be getting another chance on a big stage. How much has either veteran got left? Both men have been around for a long time (Chisora especially seemingly being around forever! ), both men are well into their mid-30s and this really is a must-win fight for both men. Takam, 35-4-1(27) and stopped just twice, has not fought since his brave and gutsy challenge of AJ last October, while Chisora, 28-8(20) and also stopped just twice, picked up a routine win in March; this following his November 2017 points loss to Agit Kabayel for the European belt. This match-up, between two tough and experienced guys could well prove to be the most evenly, and most exciting, fight of the night. A distance fight looks a good bet, but either man could conceivably fade at any given time – again, which grizzled warrior has the most left in the tank? I take Takam to pound out the close decision win, perhaps ending the long career of Chisora in the process. And yes, the July card is looking a whole lot better value for money now. Fans like even-money, hand to pick bouts, and with Parker-Whyte being a fight that could go either way, and with the supporting heavyweight scrap being the same, it will be very tempting to fork out the cash to watch the card on July 28. You are here: Home / Boxing News / Dereck Chisora vs Carlos Takam: Who Wins?